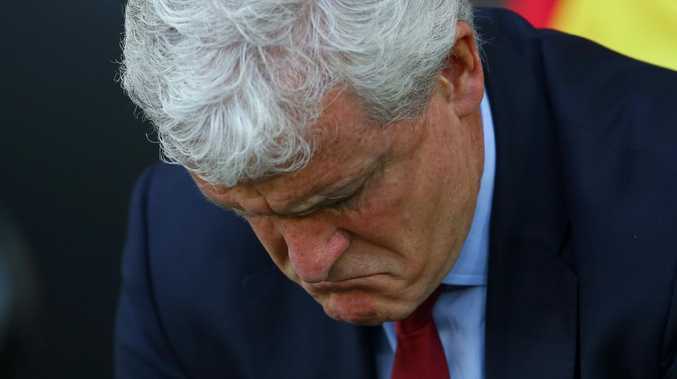 Southampton have sacked Mark Hughes. MARK Hughes has been sacked as manager of Southampton after just eight months in charge, the struggling Premier League club announced on Monday, despite an improved performance in a 2-2 draw with Manchester United. The Welshman, 55, took over at St Mary's in March and guided them to Premier League survival as well as an FA Cup semi-final but was unable to inspire a better campaign this season. Former RB Leipzig boss Ralph Hasenhuettl is reportedly the frontrunner to replace Hughes - the new boss will be Southampton's fourth permanent manager in 18 months. "We would like to express our thanks to Mark and his staff for all of their efforts during their time at St Mary's," the club said in a statement. "The search for a new manager to take the club forward is already under way. "First team assistant coach Kelvin Davis will lead the team for Wednesday's Premier League game against Tottenham Hotspur at Wembley." Assistant first team manager Mark Bowen and assistant first team coach Eddie Niedzwiecki have also left the club. Southampton, who were 2-0 up against Jose Mourinho's United at home on Saturday at one stage, are 18th in the Premier League, just one point ahead of bottom club Fulham. They have won just one of their 14 Premier League matches this season under Hughes, suffering seven defeats. The former Manchester United, Barcelona and Chelsea forward signed for Southampton as a player towards the end of an illustrious career. During his subsequent coaching career he has managed Wales as well as Blackburn, Manchester City and Stoke. Asked if being given control only up until Wednesday's Tottenham trip suggests a permanent appointment will happen before the weekend, Davis said: "To me it does indicate that. "But whether that happens or not will be up to the guys upstairs. I'm taking the team up until Wednesday and we'll see after that." The former Saints goalkeeper revealed his pride at taking temporary charge of the club but said he would not look beyond Wednesday's match. "The opportunity I've got now is to take the lads for a couple of days' training and to prepare for the Tottenham game," Davis said. "After that is after that. I don't think it would be wise to even consider anything after that."